Joseph Bail (French, 1862-1921) painted many views of kitchen helpers and young cooks. On this Labor Day, I’ve included some of his paintings depicting children working in a kitchen c.1893 ... a few of the scenes are playful, others poignant. Most of the paintings are privately owned or their ownership is not noted. The last picture, the "Young Cook" is in the Hermitage Museum, Russia. 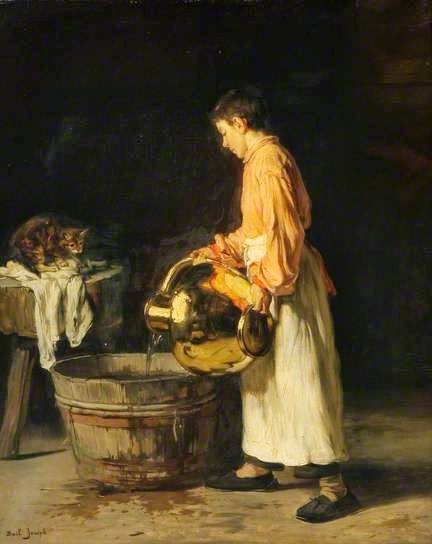 The "Domestic Scene" (the boy pouring water in a tub) is at the Government Art Collection (UK) and "Blowing Bubbles," 1899 (with two boys) is in the Galerie L'Ergastere in Paris.